The Mystic Dragon sees the future in the crystal ball while cradling the Pewter Stein between its wings. Rest your thumb against its head, slide your index finger behind, and the rest of your fingers will comfortably rest behind its body for an extremely comfortable hold (no matter what size your hand is). 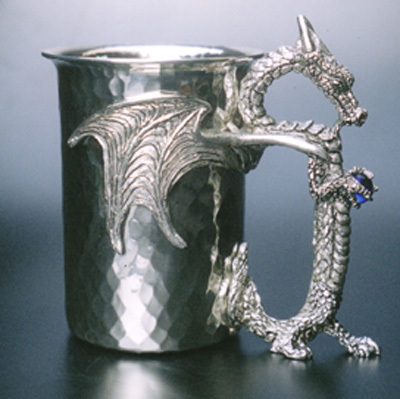 The Pewter Stein holds 22 ounces when filled to the brim, and is 3 3/4" across at the rim. We make it by hand from lead-free pewter so it's suitable for drinking all cool liquids.